5'2½" CRESCENT CITY RR CO. ~ 1894 + NEW ORLEANS CITY & LAKE RR CO. ~ 1894 5'2½"
Three types of cars in this order, no orderly assignment of numbers grouping the cars in separate classes! DP 8/19/94 mentions 30 closed and 20 opens (some of the closed were “wireside” types — screens instead of side panels, rocker panels in place). Article states (also) “16 large closed” (first of the Brills ordered 1893-94). Cars ordered for Hart franchises numbers 1 & 2 (Peters Ave., “back o' town” to Canal St., another to cross Canal St., a long line uniting upper & lower parts of the city). DP 2/10/93 p. 10 notified the cars had left St. Louis, & DP 2/18/93 that ten cars had reached N. O., commenting on the “wine colored” livery. Cars sat inside for over a year until (DP 8/19/94) the first trip “over the new Judah Hart Line” on Aug. 18th. Excellent P car 13 (wireside) S p. 111. Article in “Looking Back” by Marjorie Roehl (TP - date not avail.) titled “Little 50” described as a small closed car, as contrasted with its larger sister car of same “name” (pictured in woodcut line drawing in the article with what appears to be a Lord Baltimore truck and Herr fender, dating the photo at or after 1912, when this fender was developed in N. O. and attached to many cars). This casts doubt the 1893-built 50 (22' Brill) became a private car. The 1918 roster states the NORy&L Co. private car was a 22' Brill; there were 25 other 22' Brills in service in N. O. however, so any one of those could have had the honor (see: Private Cars p. dd). “Little 50”, the article continued, was a “Jonah” or “jinx or hoodoo” ran on Peters Ave. line, then to the Tchoupitoulas line, then to the Henry Clay line, finally cut in half by an Illinois Central loco. circa 1922 (yet research failed to encounter that event!). 23 COL 8/27/99 “trolley party” 50 PA 11/28/94, 3/8/95, TCH 4/21/95, HC 1/16/98 CLOSED as described by Mrs. Roehl's article. 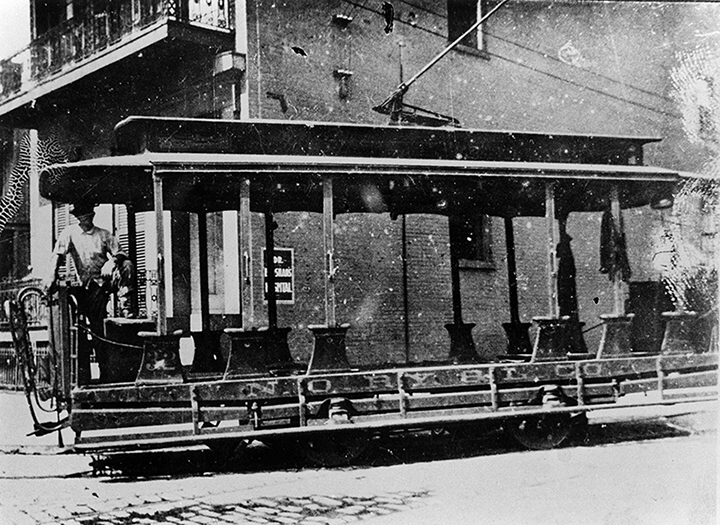 * Note: Newspapers at the turn of the century often used the term “trolley” but as time elapsed the term “streetcar” — in N. O. — has acquired the popularly accepted use, even in newspapers. 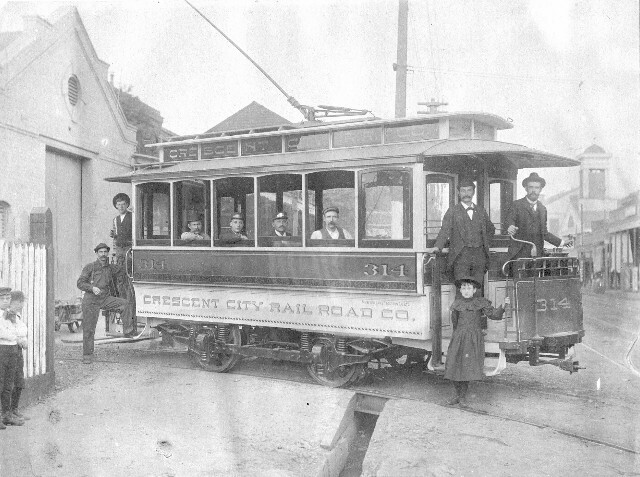 “Trolley parties” usually made use of an open car, so nos. 14, 21, 23, 26 & 28 are probably also open cars. N. O. TRACTION CO., INC. for CC RR Co. and NOC&L RR Co. There were 201 (poss. 202) cars in this seven-order purchase. Two basic body sizes, 20' OB and 22' OB. The first three orders had notched sash frames on the sides (76 cars) while the rest had arched windows. Single sash lowered into pocket below elbow rail, but with part of sash above — uncomfortable. Cars equipped with Brill 22-E “Eureka” trucks but had difficulties with derailments. Perhaps all were RT over several years. Car 89 had McGuire A-1 suspension truck P - S p. 112. Car 94 on Brill 21-E truck P - N; car 187 had St. Louis 8 truck P - S p. 111; car 288 had Brill 21-C truck P - S p. 116. Several other P showing cars ST at N. The 22-E had 33" wheels on motored axle. Cars delivered with Crawford fenders, but beginning ca. 1912 were fitted with Herr fenders (S p. 114). SRJ Sept. 1894 p. 544 “Cars 20' over end panels” (OB), 7'8" at belt rail (width), twin opening doors at bulkhead, drop sash. Inside finish: “cherry throughout”, decoration known as “Italian finish” designed for Brill especially by Italian artist. Headlinings, ventilators, glass, etc. decorated to correspond with interior finish. 26 in operation now, 50 more in a month. SRJ Nov. 1894 p. 745, more descr., cars designed specifically for “ease of riding”. SRJ Oct. 1896 p. 613 — cars had “Palace No. 2 finish throughout.” Their numbers in N. O. exceeded only by the FB&D cars. All deliv. with LGT seats, conv. completely to TV seats by 1903. Text copyright © 2008, 2009 Louis C. Hennick. Pictures copyright © 2009 by the persons credited. Picture captions copyright © 2009 Louis C. Hennick and H. George Friedman, Jr. All rights reserved.